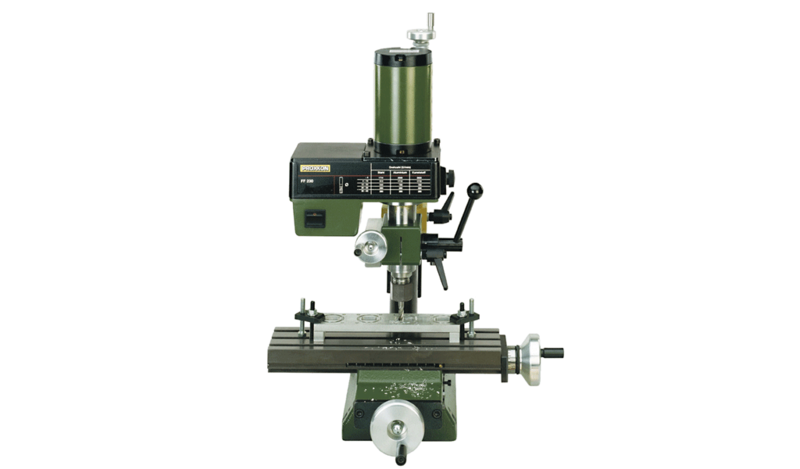 A small, high accuracy machining system to mill, drill and bore. Hand wheel serves as height adjustment. Poly-V drive system offers 6 speeds between 280 and 2,500rpm. The clamps and work piece shown are not included. Hand wheels with zero adjustable scale, 1 rev = 1/16" (1.5mm), 1 division = .002" (0.05mm). The MICRO Mill FF 230 is a small, accurate milling system used to mill, drill and countersink steel, cast iron, aluminum, brass and plastic. The headstock swivels through 360°, indicated on a scale. Height is adjustable. One revolution equals 1/32" (1mm) travel, 1 division equals .002" (0,05mm). The quill and headstock may be locked in position, which is essential when milling. The powerful permanent magnet motor drives via a poly-v-belt, yielding high torques, especially at lower speeds. The machine comes with three collets of 15/64", 5/16" and 25/64" (6, 8 and 10mm). The solid table has a size of 10 5/8" x 3 5/32" (270 x 80mm) and is T-slotted to 15/32" x 15/64" x 13/64" (the MICROMOT norm of 12 x 6 x 5mm). For best results when milling, it is recommended to lock the headstock. This is easily done via the FF 230's lock levers. Fine feed available separately as NO 24 140. Made of 1/16" (1.5mm) thick sheet steel, powder-coated. Secure stand due to drill holes for fastening to a work surface (the use of steel sleeves keeps the tray tightly sealed). 27 1/2" x 16/12" x 1 37/64" (L 700mm, W 420mm, H 40mm). Easily installed. The feed may now be used via the height feed (vertical) or the fine feed in the tilted position. One revolution is equivalent to 1/16" (1.5mm) spindle travel, with 1 division = .002" (0.05mm). The graduated scale can be reset to zero. Includes 1 each collet for round stock 3/32", 7/64", 1/8", 5/32" and 13/64" (2.4 - 3.0 - 3.2 - 4.0 and 5.0mm). Supplied in a wooden box and lid. German industrial drill chuck for MICRO Mill PF 230 and FF 230 with 13/32" (10mm) capacity and 13/32" (10mm) arbor to fit the 10mm collet. Consists of 2 step blocks and 2 clamps, 2 nuts, 2 T-slot nuts. Secures objects to approx. 1 3/8" (35 mm) high. May be used with PD 230/E and FF 230. Supplied in wooden box. HSS, all with 15/64" (6mm) shank. Cutters of Ø 5/64", 7/64", 5/32" and 13/64" (2, 3, 4 and 5mm). Double fluted. Supplied in wooden box. HSS, 4 cutters Ø 15/64", 9/32", 5/16" and 13/32" (6, 7, 8 and 10mm). Four flute design. Supplied in wooden box. HSS, 60°. Complete set with sizes of 2, 2.5 and 3.15mm (5/64", 3/32", 1/8"). Made from high-quality Cobalt HSS, pre-ground. Packaged in a wooden box. Milled in steel. Can be used on its side and back. Width of jaws 2 3/8" (60mm), clamping capacity 1 2/3" (42mm). Complete with mounting bolts. Packed in a wooden box. Used to clamp various work pieces. Made from hardened steel, precision ground in pairs. Four different depths of prism incisions V, all at 90°. Size 2" x 1 3/16" x 1 3/16" (50 x 30 x 30mm). The solid clamp and knurled knob ensure superb securing of the work piece. 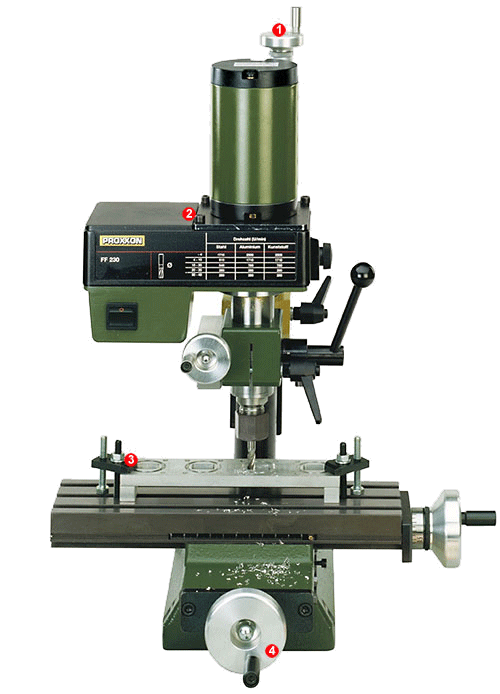 Used for fast and accurate location of starting point of work pieces with respect to the machine spindle on milling machines. Size 15/64" x 15/64" x 2" (6 x 6 x 50 mm) and 15/64" x 3/16" x 3" (6 x 5 x 75mm). Comes in a wooden box.